With less than a week until the Swedish royal wedding in Scotland, let's continue our look back to the most recent Bernadotte weddings. Two years ago today, Princess Madeleine married Chris O'Neill in a wedding that will likely resemble the one her brother celebrates this weekend. 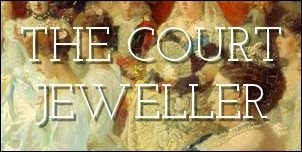 Tomorrow, we'll examine the tiaras from Madeleine's wedding; today, let's have a look at the jewels worn the night before! For the pre-wedding dinner hosted by her parents, King Carl XVI Gustaf and Queen Silvia, at the Grand Hotel in Stockholm, Madeleine wore a gorgeous, glittering Elie Saab gown. She accessorized with dramatic earrings featuring an aquamarine drop. Queen Silvia matched her jewelry to her red gown, wearing her set of modern diamond and ruby jewels. Crown Princess Victoria, Madeleine's sister, wore delicate diamond earrings and a coordinating bracelet. The king's sisters also attended the pre-wedding dinner. Princess Margaretha wore diamond earrings and a diamond necklace, while Princess Birgitta wore a distinctive diamond cross necklace and diamond earrings. The king's third sister, Princess Désirée, is looking away from the camera in the photo above. She wore pearls for her niece's pre-wedding dinner. Princess Christina (one of Madeleine's godparents) attended the dinner, too, wearing an extremely whimsical necklace and bracelet set. Some of Madeleine's Swedish cousins attended as well. That's Princess Désirée of Hohenzollern, daughter of Princess Birgitta, wearing pearls and a stack of bracelets. Princess Christina's eldest son, Gustaf Magnuson, brought his girlfriend (now wife) Vicky, who wore a delicate diamond necklace. A few foreign royals arrived early to attend the pre-wedding dinner as well. Princess Märtha Louise of Norway wore exuberant earrings with her green dress. Princess Marie of Denmark went with slightly more subdued diamonds with her neutral evening gown. The Greek royal cousins (who are related to the Swedes via their grandmother, Queen Ingrid of Denmark, who was King Carl XVI Gustaf's aunt) brought a bit more sparkle. Princess Marie-Chantal wore a large golden cuff bracelet and glittering earrings with her sparkling dress. Princess Tatiana wore statement diamond earrings and a stack of bracelets with her midnight-blue gown (probably my favorite dress of the entire evening!). Hereditary Grand Duchess Stéphanie of Luxembourg opted for diamond pendant earrings and an evening watch, plus a very sparkly clutch. And, predictably, Princess Charlene of Monaco wore ... absolutely no jewelry at all. You break my heart, Charlene. But Princess Takamado did better in the jewelry department. The Japanese imperial ladies usually wear only white jewels, so it was extra exciting to see what looks like a sapphire in the clasp of Hisako's pearl choker necklace. Princess Anna of Bavaria wore a truly intriguing bracelet, plus a pair of pendant earrings. Hereditary Princess Kelly of Saxe-Coburg and Gotha wore a stunning heirloom jewel: the Albany diamond necklace. It was a wedding gift to Princess Helena of Waldeck and Pyrmont (the wife of Prince Leopold, Duke of Albany, a son of Queen Victoria and Prince Albert) from her parents in 1882. Leopold and Helena were the grandparents of Princess Sibylla of Saxe-Coburg and Gotha, who was the mother of King Carl XVI Gustaf of Sweden. I'd be remiss, I think, if I didn't include the glittering jewels worn by the groom's family. Chris's mother, Eva O'Neill, wore gold statement earrings and a jewel-studded clutch with her bright pink gown. And Chris's sisters, Countess Natascha of Abensberg-Traun and Tatjana d'Abo, also wore major jewels with their evening gowns. That's it for today's jewel rewind -- stay tuned tomorrow for tiaras from Madeleine's wedding! And, as always, you can catch up with all of our posts about the upcoming Swedish royal wedding here!